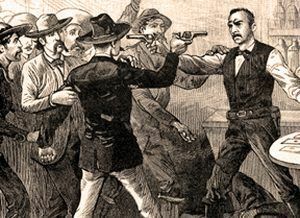 The Trinidad, Colorado Gunfight, was one of the many gunfights fought in the Old West, occurred on April 16, 1882, between two professional gamblers, Frank Loving and John Allen, who had earlier been acquainted in Dodge City, Kansas. Frank Loving, who had been involved in the Long Branch Saloon Gunfight in Dodge City, Kansas in 1879, had moved on to Trinidad, Colorado by 1882. A professional gambler, he was dealing faro in the Bank Exchange Saloon, when he often quipped that it was his slow draw that had enabled him to win the earlier gunfight. Also in Trinidad at the time, was another old Dodge City acquaintance and gambler, John Allen. Allegedly the two had been arguing for some time over loans the two had made to each other. On April 15, 1882, the argument came to a head on Trinidad’s Main Street when the words became so heated that it caused both men to draw their revolvers. However, the gunfight was avoided when friends intervened. But, the very next evening when Loving entered the Imperial Saloon, where John Allen worked, Allen stood up with his gun in hand and took a shot at Loving. Frank responded by pulling his own Colt 45, but as people began to scramble for cover, the gun was knocked from Loving’s hand. Shielding himself behind another man, Allen fired another shot. Loving then bent over to retrieve his revolver as Allen fired a third shot. Headed for the rear door, Loving pursued him emptying his revolver into a darkened back room. But, Allen had gone into the alley and taken refuge in Hammond’s Hardware Store, a few doors down. In the meantime, Jim Masterson, former Dodge City marshal, had accosted Loving, disarmed him, and notified him that he was under arrest. Leaving Loving in the Imperial Saloon, he then went after John Allen but couldn’t find him. When Masterson returned to the Imperial Saloon, he found Loving had acquired two other guns and had gone looking for Allen. Masterson was quickly on his tail again and finding him at the Catholic Convent down the street, again disarmed him and went looking for Allen. Suddenly, a shot rang out from Hammond’s Hardware Store and Masterson quickly headed there, meeting Frank coming out the door, saying “Jim, I’m shot.” Having gone into the hardware store to refurbish his ammunition supply, Frank had been struck in the back by a bullet. Allen, who was hiding in the rear of the store was quickly arrested by Marshal Lou Kreeger and taken to the county jail. In the meantime, Frank Loving was treated for his wound, but died five days later, on April 21st. Charged with murder, John Allen was tried in September, but was found not guilty and walked away a free man. Later he headed back to Dodge City and eventually became a street preacher and traveling evangelist. By Kathy Weiser-Alexander, updated February 2019.